W00t! New books have arrived. This year's second semester will start in about a week. In preparation for my new courses I've been ordering books left and right. Luckily I already own the most expensive book on the list, so I won't have to get that one. * A pamphlet entitled Don't touch me! The last two items weren't on the official book list, but I decided to get them anyway. Learning maths because it will make a nice addition to my current library. Don't touch me! because I am very curious how one would handle a situation where kids are harassed by others. This leaves two syllabi that I should buy at school. After that I'm all set. How is it possible for one book to be both highly educational and (IMNSHO) absolutely craptacular at the same time? 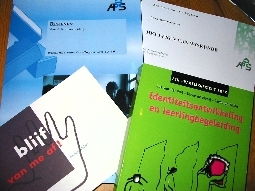 Case in point: Lesgeven en zelfstandig leren by Geerlings and Van Der Veen. This course book covers basic didactics of teaching at the high school level. It covers all kinds of interesting subjects and I feel that there's a lot for me to learn. Unfortunately the book's laced with three things that irk me. 1. To me it seems that the authors often skim over stuff that could be very interesting. Instead of taking an analytical, or academic approach, they fill chapters with examples and stories. There's nothing wrong with examples, but neither is there with pure psychology. 3. Their writing is atrocious at times. At the beginning of chapter five there's a sentence that runs for a full -ten- lines! It runs a hundred and thirty words in length! What the fsck were they thinking? In reality, assessing the beginning situation [of a student] is done based on 'experience'. This is a conglomerate of pedagogic-didactical knowledge and intuition.